Turkey Day can wreak havoc on your face: Extra wine consumed at dinner, Loads of sugary snacks and Mom’s delicious stuffing. Once the plates are cleared, you may notice an all-over bloat and puffiness that isn’t so cute. There are a few tricks to get back to your perky, pretty self, even after slipping into a food coma. 1. Apply a cold compress to your face first thing in the morning. Chances are you will be sporting major under-eye bags, so you can also use gel eye packs that are stored in the freezer to bring them down. 2. Start drinking room temperature water with lemon, and keep drinking all day long. Seriously! Re-hydrating your body will help with the bloat and erase signs of dryness. Throw in a coconut water, too, which is amazing for fighting dehydration. 3. You shouldn’t skip food the next day, but try to eat clean. Have an egg white omelette with lots of antioxidant-rich veggies and a cup of green tea. 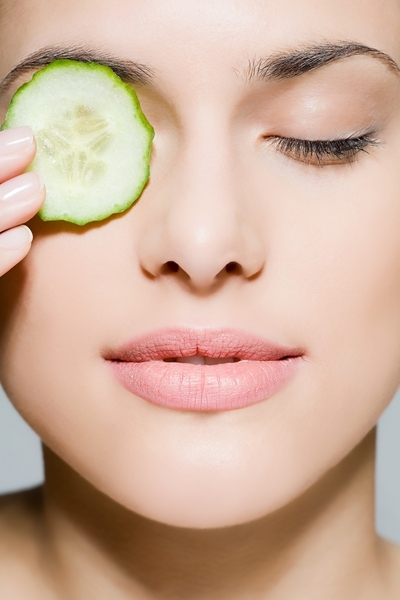 The veggies and tea will help your skin restore its normal glow. 4. Now it’s time to get some cosmetic help from a primer. I suggest my Sally Hansen Natural Beauty Inspired By Carmindy Luminizing Face Primer for a glowing complexion and smooth texture. 5. Put a thin layer of foundation over the primer, and dot on a brightening concealer under the eyes, but do not apply it to raised areas of puffiness. Instead, trace the concealer on the recessed deepest part under the eyes. 6. Make eyes look bright by lining them with a blue pencil. You can also apply highlighter to the inner corners of the eyes and right under the brows to further “Carmindize” your look. 7. Finish your look by blending on a bronzer along the temples, the sides of the face and under the cheekbones. Sweep a pink blush on the apples of your cheeks to make your skin look more awake. A pink lipstick, balm or gloss will finalize the look, so you can look your best while getting back on track! Find your holiday look in the Makeover Studio!